Saint Petersburg is a beautiful city with impressive architecture. 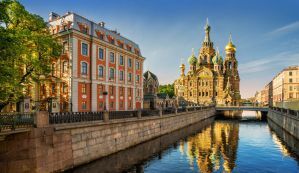 It's the second largest city in Russia and is a popular tourist destination so there is no shortage of hostels and hotels. If you're traveling alone, you'll find plenty of hostels with social atmospheres and fun environments, so it won't be long before you make a few friends. 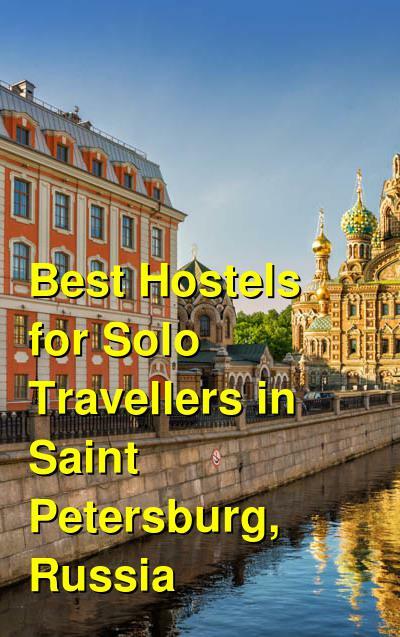 How much do hostels in Saint Petersburg cost? This hostel is an eclectic and fun place to stay. It has a range of options for solo travelers including private rooms with attached bathrooms or bunk beds in dorms that have a private feel. It's a favorite hostel in the area in part because you can have the privacy and personal space of a hotel with the social atmosphere of a hostel. The hostel is conveniently located in the heart of the city and it is close to many attractions including St Isaac's Cathedral. It's located in a 150 year old building and sits along the Moika River. The hostel has plenty of common space where guests can relax. There's a television lounge, a reading area, and a balcony that looks out over the river. There are also plenty of amenities for guests including a shared kitchen, secure lockers, and travel information. The staff can also help you coordinate your Russian Visa if necessary. This hostel is another favorite in St Petersburg. It's a simple but fun place to stay that is affordable for those on a budget. The hostel has rooms that have recently been renovated and each has access to free wi-fi, lockers, and comfortable beds. The hostel also offers all the standard amenities including travel information, parking, city maps, towels and linens, lockers, laundry facilities, and a shared kitchen. The hostel is conveniently located in the heart of the city. It's near many of St Petersburg's top attractions including museums and theaters. There are also many pubs, bars, and restaurants nearby. If you're traveling alone and are looking for a place that encourages guests to socialize, then this is a great option. It has a friendly and welcoming atmosphere and you're sure to make a few friends while you're in town. Another favorite in the city, Baby Lemonade Hostel is a welcoming place to stay that is a great option for independent travelers. The hostel is relatively new and is designed with a 1960's style. It has a "free atmosphere" that brings to mind the times of flower power and the music revolution. There are both shared and private rooms available that can accommodate everyone from those on a tight budget to those looking for a little more personal space. Dorms range in size from four beds to ten beds. There are also rooms available for small families, groups, and couples. The hostel is conveniently located in the middle of the city. It's near the Summer Garden, the Inzenerny Castle, and the Russian State Museum. It's also near many of the city's best bars and clubs as well as cafes and restaurants. The hostel has all the standard amenities including a shared kitchen, travel information, linens and towels, and a 24 hour reception area. If you're looking for an interesting place to stay with a unique atmosphere, then Baby Lemonade Hostel is an excellent option. The CubaHostel is another popular hostel for independent travelers and backpackers in St Petersburg, Russia. The hostel is recommended by many of the top guidebooks so advanced reservations are recommended. It's an affordable option that is in a great location, walking distance to the Hermitage and many other sights around the city. It's very close to the Kazan Cathedral and is easily accessible with public transportation. The staff is fun and friendly, and it's not uncommon for them to check out the city's nightlife with guests. They know the best places to go for the best parties and events, so if you stay here you will have an inside scoop about what's going on around town. The hostel has all the standard amenities including internet, wi-fi, travel information, tea and coffee, as well as car parking. Guests also get a free shot of Vodka from the bar area. If you're traveling alone and are looking for a fun place to stay, then the CubaHostel is a great option.